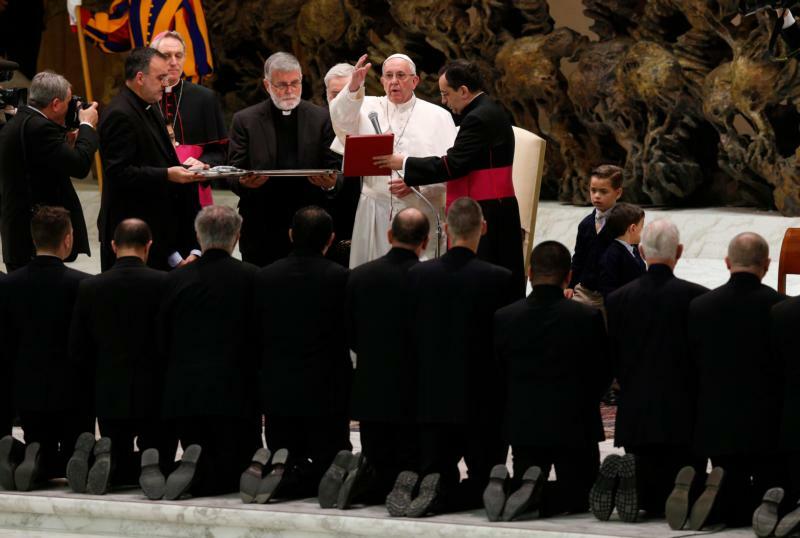 VATICAN CITY (CNS) — The church is holy, but the devil loves to tempt its human members to be proud and judgmental, which sows division, Pope Francis told members of the Neocatechumenal Way. “The enemy of God and man, the devil, cannot do anything against the Gospel, against the humble power of prayer and the sacraments, but he can do great harm to the church by tempting our humanity, provoking presumption, judgment of others, closure, divisions,” the pope said March 18. Meeting with the pope at the Vatican, the Neocatechumenal Way was preparing to send priests and 250 families out on missions of evangelization and education to every continent. The Neocatechumenal Way guides members in an itinerary of exploring the meaning of their baptism and learning to live according to its promises. With respect and love for others and for their identities, he said, the missionaries will give witness to and preach a living, life-giving Gospel message that is attractive and has meaning for every individual. Individuals and groups are purified, he said, through obedience to the church and its pastors.